Wha-hey” as Robert Burns might have said, there are lots of snowdrops everywhere! That means Spring is on the way! Soon there will be daffodils, and then bluebells, and then tree blossoms, and before you can say Jack Robin, we will be sunbathing! Maybe I sound optimistic but the weather in Scotland has not been at all bad this winter. I should really only speak for my area, Dunfermline in Fife, as there certainly have been snow problems in the Mountains. I have lived in Dunfermline for nearly eleven years and at first it seemed rather small after over thirty years in London, and before that New York City, Zurich, Antwerp and The Hague, where I was born in Wassenaar. But it quickly grows on you and we are very happy here. One reason that brought us here was that my younger daughter got married and has two of our lovely grandchildren. Meanwhile my elder daughter also had two children and lives in the south of England, which means that we trek happily back and forth. Edinburgh is about 30 minutes away from Dunfermline by car (or rail), over the Forth Road Bridge. Next year the new “Queensferry Bridge” will be completed, making a trio with the iconic Forth Rail Bridge which has just celebrated its 125th anniversary. Of course almost everybody knows about Edinburgh, but we have found that Dunfermline is a great place to live, and we love its royal and ancient history. Its origins go back to King Malcolm III who defeated Macbeth and married Margaret, a Saxon princess fleeing from William the Conqueror of England. The pious Queen Margaret was later canonised and her son David built a Benedictine Abbey on the hillside which must have been a wonderful sight to the pilgrims who visited her shrine. Malcolm’s dynasty reigned for over 200 years when Edward I of England tried to subdue Scotland, but finally Robert the Bruce triumphed. His grave is in Dunfermline’s Church. Much of the Abbey was destroyed by zealous Protestants during the Reformation in 1560. However, the magnificent Romanesque nave survived as the parish church, and in 1824 a new church was added. From its earliest days Dunfermline was the seat of Royalty and a Palace was built next to the Abbey for the family and for visitors. Both Robert the Bruce and Edward I lived here (but not at the same time!). James VI lived in the Palace, and Charles I was born here. When Queen Elizabeth died in 1603, James and his Court moved to London. After this the Palace soon decayed and now only one magnificent wall remains. Not to be missed in Dunfermline is Abbot House (or “The Pink Hoose” as locals call it) just across the ancient Graveyard. Dating from the Abbey’s heyday, it is both a museum and a café. You must try their home-baked scones and cakes! It was probably not the Abbot’s home but it has had many uses in its time. Lady Anne Halkett (Hackett), a teacher, herbalist and midwife, lived here for many years following an exciting life at the Stewart Royal Court in London. In the 1990’s the house was carefully renovated, the café installed in the barrel-vaulted lower rooms while the upstairs chambers displayed Dunfermline’s history and its notable residents. Taking tea in the herb garden over-looking the Abbey is delightful. Pittencrieff Park, known locally as “The Glen”, was once a royal hunting ground below the great monastery. The name “Dunfermline” is said to derive from a hill with a tower, surrounded by a winding ‘burn’. Although the tower has been reduced to its foundations, it still sits on a rocky outcrop making a loop in the stream at its base as it flows gently through the deep, tree-covered valley. To the west is a landscaped park which was owned by a succession of landowners. One notable laird was General John Forbes whose home was Pittencrieff House, an imposing orangecoloured, lime-coated building overlooking the Burn and with commanding views of the Park. Forbes was the general who, in 1758, engineered the successful 300-mile trail through Pennsylvania to take Fort Duquesne from the French - with the aid of a young George Washington. Forbes named the captured settlement Pittsburg in honour of William Pitt, the Prime Minister, and it is where Carnegie made his millions. Later owners of the Park have landscaped the grounds and added features like the ‘Laird’s Garden’ and the tropical greenhouses. Andrew Carnegie was born in 1835 in a tiny cottage in Dunfermline near the Park, and the story goes that when ‘Andra’ was young, radical members of his family fell out with the owners of the Park and his family was banned from coming there. The great philanthropist got his own back when he returned as the richest man in the world. 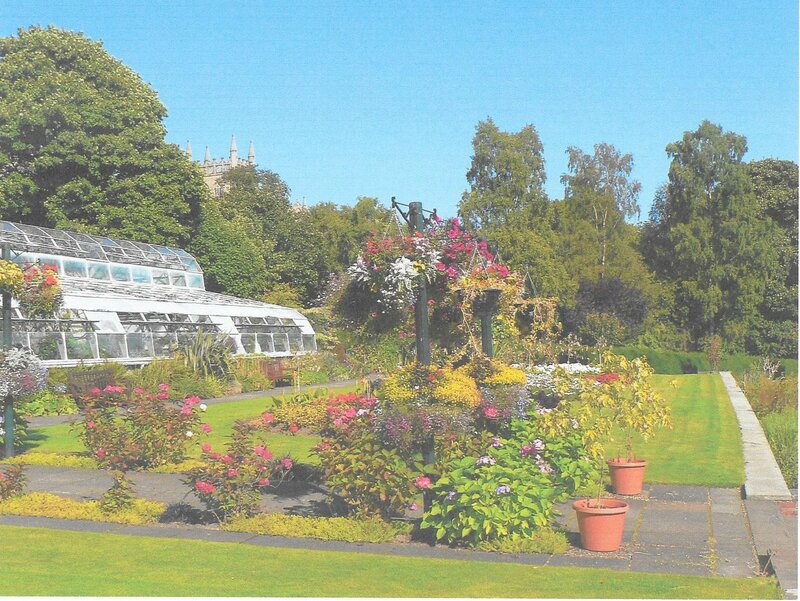 He bought the whole place and ‘gifted Pittencrieff Park to the people of Dunfermline for ever’. The cottage has since been expanded into a museum of the great man’s life and achievements, and it is well worth a visit. The ancient county of Fife is surrounded by the sea on three sides with a succession of charming old fishing villages. During the last few years a scheme to construct the Fife Coastal Path, a continuous footpath all round the coast, has been completed. We particularly enjoy a section of the path around the little port of Aberdour, past its golf course, between fields to a ruined church where we sit and look out across the Firth of Forth to Edinburgh and “Arthur’s Seat”, the volcanic hill on the far side of the city. Scotland is a great place for walkers and recently the availability of distance-walking, or ‘pilgrimage’ has become a topical issue highlighted by the revival of the European pilgrimage routes to Santiago de Compostella in Spain. It’s not just for religious pilgrimages, although that is reviving, but health pilgrimage is increasing, and cultural history pilgrimages are popular. People are realising that sights and folks met along the way are just as important as arriving at their destination. With local and national support, Scottish Pilgrim Routes Forum is planning off-road routes across the country. Scotland has its own saints including St. Columba, St. Kentigern and St. Andrew. Dunfermline’s own St Margaret will feature in a re-created Fife Pilgrim Way across the county to St Andrews. Based within the trendy boutique hotel, The Halkin, situated in Belgravia, lies the one Michelin Star Spanish restaurant, Ametsa with Arzak Instruction, which was opened to replace Nahm, just over two years ago. Ametsa with Arzak Instruction is a unique collaboration between Elena Arzak – voted Veuve Clicquot World’s Best Female Chef in 2012 – along with her father Juan Mari Arzak, and Mikel Sorazu, Igor Zalakain and Xabier Gutierrez. Ametsa’s approach is rooted in the traditions of ‘New Basque Cuisine’, pairing the earthy flavours and techniques of Spain’s Basque region with modern, surprising twists featuring locally sourced and organic produce from land and sea. The unique interior of the restaurant was designed by London-based Ab Rogers Design, who took inspiration from the raw aesthetic of the original Arzak restaurant in San Sebastian, Spain. 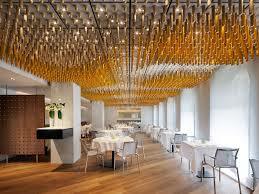 The focal point of Ametsa is a wave-like ceiling, created from 7,000 glass receptacles filled with a variety of different spices. The evening we were dining found the restaurant quite busy but the atmosphere was relaxed. There is no table turnaround, so diners can enjoy their meal at their leisure, without being rushed; quite an unusual, but very welcome feature in a Michelin Star restaurant. Apparently the best way to experience the menu here is via the Tasting Menu (£105 per person, £154 with 5 glasses of wine paired specially by the sommelier). There is, of course, an à la carte menu available, but as the Tasting Menu included a fish and meat dish from the à la carte menu, it seemed like a good idea. The journey through the tasting menu began with a scene-setting selection of “aperitivos”, beautifully crafted on their platters and platforms. The aperitivos are delivered at the same time, as a piece of cleverly constructed artwork, which takes up the whole table. Each mouthful provides something to delight the taste buds, with a variety of flavour combinations; from onion and anchovy to mango and chistorra; these morsels were quite delicious. The entrées followed – ‘Scallops at Home’ is a variation on a classic dish that proves eternally popular, and with good reason; the scallops were among the best I have eaten. This was followed by Langoustine on a Bed of Lichens; another winner in my eyes, being a great seafood lover. Finally, in this section was the ‘Graffiti Egg with Green Sauce’. This dish was not to my wife’s liking, accompanied as it was by cold mussels. Whilst I enjoyed it, the contrast provided by the soft poached egg was certainly surprising, but then ‘surprise’ is something they do very well at Ametsa, as we were to discover. We both agreed that the fish course was the highlight of the meal so far. My wife opted for the John Dory with Crispy Beetroot Sauce, and I enjoyed the Grouper with beans. We couldn’t fault these dishes; delicious in their pairings, and with a soft flaky texture that makes good fish effortless to eat. The meat course offered a choice of Ox, Suckling Pig, Lamb and Beef fillet. My wife had the Suckling Pig on Carob Crumbs, a surprising combination, but one that worked. The empty plate was testament to that! I went with my curiosity and ordered the Lamb with Cottage Goat’s Cheese. The lamb was medium rare, and very tender. Combining it with cottage goats cheese was certainly unusual, but that is the joy of Ametsa: a willingness to be bold and different. Creativity is clearly in the blood. The menu, which had been presented to us at the beginning of the meal in our own envelope, gave a brief description of one element of the dessert as ‘Mead Fractal’, this was a mystery to both of us. The only knowledge I have of mead is as an old English drink. The dish that was presented was a gift to the senses. A piece of art unfolds before your eyes as the dish is completed in front of you, and the result was a light, sweet clear soup, with a fruity addition. The Clove Custard, Toasted Milk and Pineapple Ice Cream that followed made this a most memorable and delicious dessert, but sadly one that I know I would never be able to recreate. You have the sense that each of these dishes has been through a rigorous creative process involving experimentation that only a truly passionate professional would be prepared to undergo in order to come up with something new. Naturally, the menus at Ametsa change to reflect the seasons, but without doubt, you could expect the same surprising twists at any time of the year. This is combined with friendly service from a staff that are visibly passionate about the restaurant and seem genuinely excited about the cuisine. Their knowledge of the menu and the wines is extensive, which is useful when you are sampling something out of your normal comfort zone! Ametsa with Arzak Instruction showcases an interesting Basque cuisine. The menu is highly creative and entertaining. Next time, it would be nice to enjoy a little of that Spanish sunshine too! Maybe it’s just me, but when I heard about the Cinnamon Club I had visions of one of the many London Clubs that exist in our fair capital or a secret society like the ‘Riot Club’, rather than a fine dining Indian restaurant serving high quality dishes a stones throw from the Houses of Parliament, but a fine dining restaurant it is. The Cinnamon Club is the venture of Iqbal Wahab and executive chef Vivek Singh, with a vision to bring sophisticated Indian food to London. The Cinnamon Club is conveniently located near to the Houses of Parliament and Westminster tube station, (although when I visited I didn’t see any politicians of any party or lobbyists, but I am sure this is a favourite), on the site of the old Westminster library. Be warned, if you are not eagle eyed as you will almost certainly miss the entrance, as the only external evidence of the pleasures to come was a small plaque by the door. The red bricked exterior bristling with Victoriana gives way to a compact entrance hall where you choose to go downstairs to the contemporary bar, or right into the main library, sorry dining room! The bar is a real contrast to the Grade II listed building and is minimalistic whilst boosting a unique glass projection screen which runs the whole length of the back wall, and it is here you can relax sipping a Lychee Bellini or Dehli Mule, setting the scene for the main course in the main restaurant above. Despite the lure of the bar, my companion and I decided to go to our table and on entering the main dining room I was struck by the light and airy feel. With its high ceilings, parquet floors and the high brown leather seating around the edges, this could have come straight from an English club in India in the 1920’s, although there is still a slight hint of library as the upper balcony is lined with books, and I suspect it was this that encouraged me to whisper and look behind me for the strict librarian to tell me to 'shush'. Indian cuisine encompasses a wide variety of regional cuisines which vary significantly given the range of diversity in soil type, climate and the availability of the locally available spices, herbs, vegetables and fruits, and the Cinnamon Club chefs use all their expertise to take the best of all, even if it is in the heart of London rather than the best part of four thousand miles away. If you hadn't realised by now that this is not your usual Indian restaurant, a quick glance at the menu will convince you. Here there are no onion bahjis or chicken tikka for your appetisers, instead your taste buds are treated to the perfectly spiced Bombay style vegetables with cumin pao pickled red onion (£8), or Green spiced Norfolk free ranged chicken breast with tandoori chicken rillettes (£9.50), or my personal favourite, and the stand out dish on the whole menu, is the Spice Crusted Kentish Lamb Fillet with smoked paprika raita and coriander chutney (£10). The lamb is exquisite and literally melts in your mouth and the lightly spiced raita provides the perfect foil. The main courses continue the ‘around India theme’ with the Goan Sorpotel of Iberico pork presa with Goan spiced pork dumplings (£35), which was accompanied not by the usual sanna (a spongy white and slightly sweet steamed rice and coconut bread), but a steamed wine rice cake which had a similar texture, although the pork was cooked to perfection, the vinegar taste was a little too overpowering for this critic's taste buds, so be warned. Other dishes worthy of noting are the Spice Crusted Halibut with tomato tamarind sauce, ginger jaggery pickle (£25) where the tamarind provided just enough sweet-sour tang to the dense and firm texture of the halibut, and the Tandoori Wild Spencer Gulf King Prawns with malai curry sauce, dried shrimp rice (£20). All of these were accompanied by Pilau rice (£3), and a selection of breads (£7.50), which includes naan, paratha and roti. What I also like about Indian food is that it caters well for the vegetarian and The Cinnamon Club doesn’t disappoint here. A pan seared aubergine steak (£16) or the tandoori paneer with padron pepper and root vegetables (£17), were innovative and certainly not afterthoughts like many vegetarian dishes seem to be. Dessert is also a treat, and we selected the Gulab jamun and passion fruit tart with lime and mint sorbet (£7.50), and the Original Beans milk chocolate and pecan nut pudding, bitter chocolate mousse and thandai ice cream (£9.00), both fine ends to a lovely meal. The wine list is extensive and will cater for all tastes and pockets, and is cleverly chosen to truly accompany the delicate flavours of the food, but there is also a wide variety of beers for those who prefer. The Cinnamon Club has already passed its tenth year in London, and that is true testament to the quality of the food and service, which ensures that it continues to be a firm favourite with diners after all this time. Another reason is that the menu continues to change and evolve which keeps the restaurant's dishes fresh and contemporary, as it continues to use the freshest ingredients available season by season. 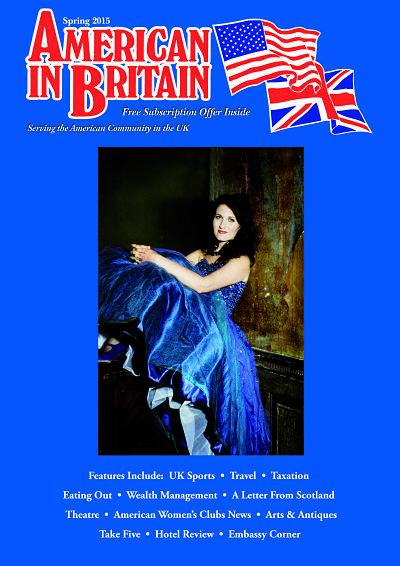 This issue’s American Eye enjoys the effervescent company of American in Britain, Paula Sides, lyric soprano and leading light of the English Touring Opera. We understand you were born and raised in Tennessee. What brought you to Britain and what made you stay? I had a very traditional Southern upbringing. After finishing my first degree at the Schwob School of Music in Georgia, I had a choice of moving up north to the Yankee states or going abroad. I chose the bigger, further adventure, to spread my wings by moving abroad. At first I knew no-one in England, but I quickly found that I loved it here and decided to stay. I studied at London’s Royal College of Music on the opera course, where I received the Tagore Gold Medal as well as meeting my future husband, Jonathan. He was in the audience at a student concert and I was singing on stage! It was instant, love at first sight for both of us. You’re set to sing the lead role of Mimi in La Boheme in the new ETO touring production. What are you most looking forward to? I have always loved singing this piece. When I was starting out in opera, aged 21 and touring with a small company, Mimi was my first major role. Now I have the chance to rediscover afresh a role that I did when I was so young. I am incredibly excited to be performing a show that I love with a company, orchestra and director, James Conway, who I absolutely adore working with. It’s a marriage made in heaven. Tell us about some of the inspirations along the way in your career. Well, first there’s my amazing, dynamic voice teacher, Llyndall Trotman. She’s a live life-to-the-fullest, make-every-moment-count sort of person who shook me out of my fairly restrictive Southern upbringing, inspired me and empowered me to grab life with both hands. Then, at the Royal College of Music I was encouraged by everyone and inspired by the whole experience of being immersed in that very special musical world and atmosphere. What do you most enjoy doing when you’re not working? I love spending time with my husband and one year old daughter, Aurelia Ruth, in the beautiful Yorkshire village cottage where we live, just relaxing or walking on the moors. What essential things would you advise Americans in Britain to be sure not to miss? I would advise Americans here to see as much of the country as possible, it’s all so varied and different. They should try climbing mountains in Wales and the Lake District, see the coast in Cornwall, explore Scotland’s islands, visit Yorkshire for the moors and the Bronte connections. London’s concert halls and theatres are great, but I also recommend visiting all the local UK venues where the ETO is performing. My favourites are the beautiful Grand Theatre in Wolverhampton and Buxton Opera House. For me at this stage with a baby it’s a guilty pleasure just to go to dinner with my husband and stay out past 9.30! One of our favourite places is the White Lion in Hebden Bridge. I really like going to the pub, which may seem funny as I don’t drink beer at all! But the whole experience is great. So many pubs in the UK and Ireland have wonderful traditions of music and folk singing. I’m reminded of all those Southern USA connections, which makes me feel right at home. Yes! Peanut butter and real grape jelly, soft drinks with lots of ice and fresh popcorn with hot butter. Can you think of a moment that changed your life? That moment would be the first time I sang “O Mio Babbino Caro” from Puccini’s Gianni Schicchi. It was the first aria I ever sang, aged 19. That feeling of being on stage and opening up your soul for a minute, performing, giving something to the audience, was both terrifying and exciting. I felt every emotion you could imagine. And I was completely addicted. 'American in Britain' magazine is always keen to promote cross-country relations– please share with us your fantasy British- American dinner party. This would be a traditional Thanksgiving dinner with lots of Southern hospitality. I’d pack the table with all the people I love– a mixture of British and American friends we’ve been so lucky to meet in our life here. I’d cook lots of food, including at least five desserts and every pie known to man. And copious amounts of champagne. At about 3 in the morning, when we’ve had plenty of food and champagne, we’d finish off with a great musical jam session.